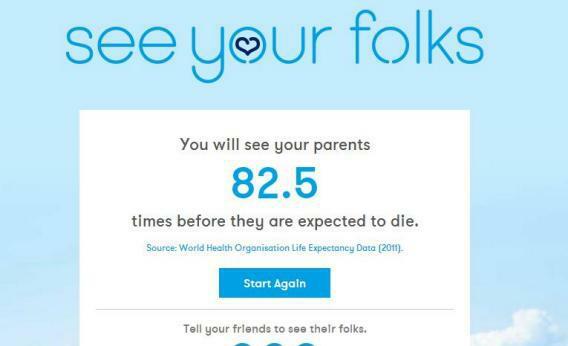 See Your Folks: a calculator to tell you how many times you’ll see your parents before they die. The interface of the website See Your Folks is very soothing. The site’s name appears in a gentle lowercase font—with a heart in the middle of the first o—against a blue-sky background dotted with fluffy white clouds. And then you enter the information asked of you—your parents’ location, their ages, and how often you see them—and are greeted with a stark figure: the number of times you’ll see your parents before they die. Suddenly, those clouds take on a different meaning. On the heels of See Your Folks comes another gentle reminder of the fragility of life in the form of a New York Times Magazine cover story about bioethicist Margaret Pabst Battin—a longtime proponent of assisted suicide for the elderly—and her husband, Brooke Hopkins, who was paralyzed from the shoulders down after a bicycling accident. Robin Marantz Henig’s chronicle of the couple’s ongoing negotiation over how and when Hopkins’ life will end is a gripping, devastating portrayal of the messiness of disability and disease—and the inconvenient truth that people often find themselves in tragic, difficult situations they never imagined they would face. Together, See Your Folks and Henig’s article will have you booking tickets to go visit your aging loved ones, stat.